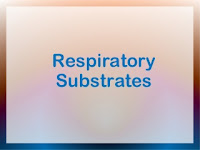 A respiratory substrate is a molecule from which energy can be liberated to produce ATP in a living cell. 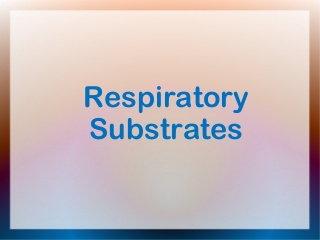 Glucose is not the only respiratory substrate. All carbohydrates, lipids and proteins can also be used as respiratory substrates. Many cells in the human body are able to use a range of different respiratory substrates. However, brain cells can only use glucose. Heart muscle preferentially uses fatty acids. Glucose is an essential fuel for some cells, e.g. brain cells, red blood cells and lymphocytes, but some cells, e.g. liver cells, also oxidise lipids and excess amino acids. 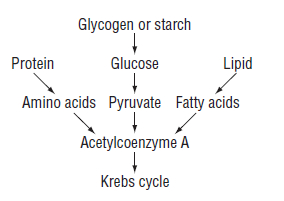 The fatty acid components of lipids are important: carbon atoms are detached in pairs as ACoA and fed into the Krebs cycle. Amino acids are deaminated and their carbon–hydrogen skeletons converted into pyruvate or into ACoA. The energy values of these different substrates are not the same. Most of the energy released in respiration comes from the oxidation of hydrogen to water. The more hydrogens there are (in comparison with carbon or oxygen atoms) in the structure of a molecule, the greater the energy value. It is hydrogen atoms that are used to generate ATP via the electron transport chain. It is possible to get a good idea of which respiratory substrate the cells in an organism are using by measuring the volume of oxygen it is taking in and the volume of carbon dioxide it is giving out. The values in the table are for aerobic respiration. If a cell or an organism is respiring anaerobically, then no oxygen is being used. The RQ is therefore infinity (00).